Getting a research paper published can be a challenge. It's even more challenging when considering the risk of rejection that comes from submitting a paper to a journal that's not the right fit. For inexperienced authors, this is a particular pain point, leading to rejections, adding months to publication and slowing career progress. Nearly a third of visitors to Elsevier's Authors' Home are trying to decide which journal they should submit their paper to. Meanwhile, editors must sift through many out-of-scope papers when authors choose journals that are a poor match. Our role is to support authors by getting them published in the best possible journal as fast as possible. That's where the new Journal Finder tool comes in. A beta version is online on Elsevier's Authors Home. You can find Journal Finder on Authors Home:elsevier.com/authors. If you click on the "Start matching" button, you will be presented with the search screen below, where you can enter your paper title, abstract and keywords. Then you are required to select the subject areas relevant to their paper. You can filter the results to those journals that have open-access options. The tool then generates a list of Elsevier journals that match the topic of their abstract. They can then order the results based on their priorities, such as highest Impact Factor or shortest editorial time. What is the Elsevier Fingerprinting Engine? The Elsevier Fingerprinting Engine is a software system that mines the text of scientific documents – publication abstracts, funding announcements and awards, project summaries, patents, proposals/applications, and other sources – to create an index of weighted terms which defines the text, known as a Fingerprint visualization. The transferability of fingerprinting to other tools in an example of how Elsevier is benefiting from the expertise of Collexis , a semantic technology software developer Elsevier acquired in 2010. Elsevier is using the "fingerprinting" technology for various products for Academic and Government Institutional Markets, including SciVal Experts, an expertise profiling system and research networking tool, and SciVal Funding, which helps researchers find funding sources and helps funding agencies find researchers to review grant applications. 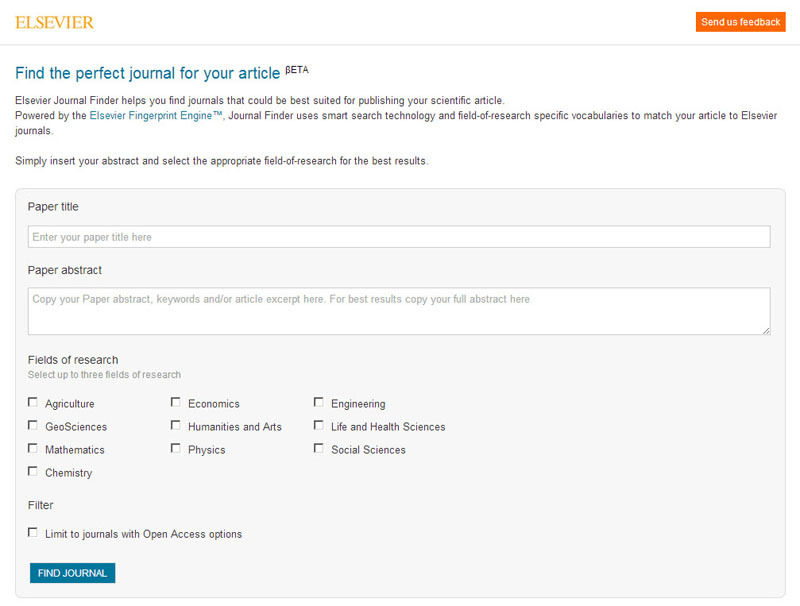 The Journal Finder tool uses Scopus and the Elsevier Fingerprinting Engine to locate Elsevier journals that most closely match an author's list of keywords and/or abstracts. An Elsevier journal will be recommended if it has published articles which have a high similarity with the new article. A list of potential journals will be created for authors and the tool will allow filtering based on author's preferred criteria (such as Impact Factor, open-access options, review time, acceptance rate, publication times and frequency). The final selected journal links directly to the journal's homepage and the Elsevier Editorial System (EES) page. The tool makes recommendations from the 2,500+ journals published by Elsevier. After being one of the first to test the tool, Dr. Adrie J.J. Bos, Co-Editor-in-Chief of Radiation Measurements, wrote: "The results matched precisely with my own judgement." At Elsevier, we receive feedback from over 60,000 authors each year. By listening to our authors, we are able to make continual improvements to our services, and design products from the vantage point of the people who will use them.In 2012, we launched the Author Mobile Apps competition, which asked early-career researchers to submit their ideas for journal-based mobile applications. The competition received an overwhelming response, with 3,775 ideas submitted. By a happy coincidence, the winning idea – a "Scope-finder" that would find the best fitting journal for a paper – had already been identified as a priority for Elsevier and was incorporated into the development of the Journal Finder tool. Hearing of this need directly from the customer confirmed that we were on the right track and should build such a tool as soon as possible. Elsevier's Journal Finder tool is helpful for authors in doubt of which journal fits their data. This can occur when it involves an intermediate field of research subjects or when authors are in the early stages of their research career, trying to locate the right journal to publish their manuscript. Sandra Yee, Dean of the University Library System, Wayne State University in Michigan, said the Journal Finder tool will help faculty members and librarians by providing "substantive data and more specific information." support@elsevier.com with the following subject line: Elsevier Journal Finder (beta) - User Feedback. As Project Coordinator for STM Journals at Elsevier, Elizabeth Ash heads the Journal Finder project. She is based in Amsterdam. 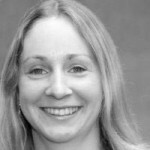 Lyndsay Scholefield is Senior Marketing Communications Manager at Elsevier, based in Oxford. I think this is a great tool! I especially like the OA options check box. I'm just planning where to submit two papers on, so good timing. I think that we need finer granularity on disciplines, and it'd be really cool if we could add "My paper is like these papers" and pop in a few DOIs (even if the DOIs aren't from Elsevier journals, as is my case). Thank you for your comment and suggestion. I'm glad to hear that you had the opportunity to discuss your ideas directly with Elizabeth.